restaurants: hussong’s cantina las vegas | eat. drink. fly. i am a fiend for mexican food. and all the awesome mexican and mexican inspired food is one of my favourite parts of traveling to the usa. hussong’s cantina is a place that we stumbled upon a few years ago and wandered into for a margarita. it turned out to be the best margarita i’ve ever had, and thus, a love was born. the food is also not so shabby, although it does lean toward the american penchant for fat & deep fried more than for true mexican style preparations, but hey, there’s a time and a place for everything. lets start with the margaritas. Hussong’s is reputedly the place where the Margarita was created—back in October, 1941 by bartender Don Carlos Orozco. He concocted the perfect mixture of equal parts tequila, Damiana (Cointreau is used now) and lime, served over ice in a salt-rimmed glass for Margarita Henkel, daughter of the German Ambassador to Mexico. now, the las vegas location is not the original, obviously, but they still make a damn fine classic margarita. 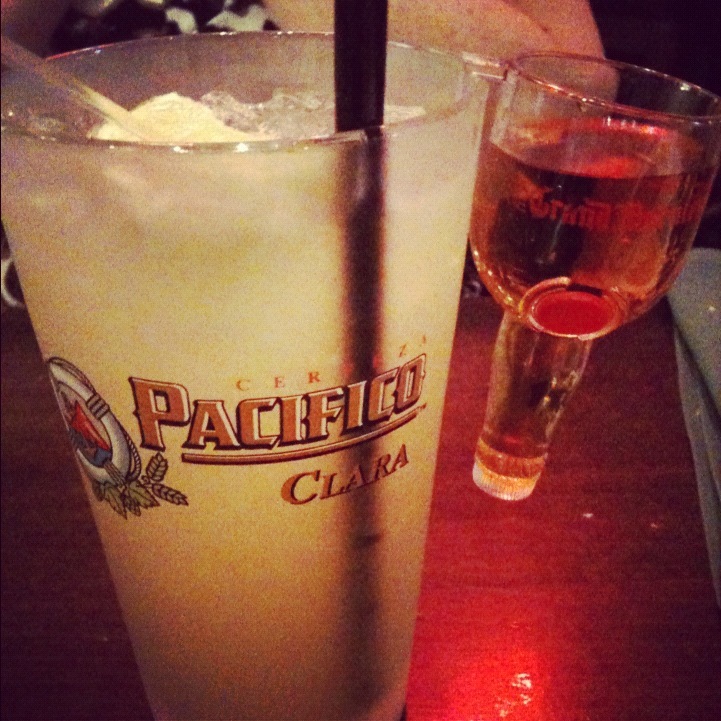 for those poor souls that don’t know… a margarita is not a slushy sugar drink. and this… will punch you in the face. i like my margaritas with no salt and a sidecar of grand marnier to make a float on top. and yes, this is a PINT of margaritas that was served to me. this is commonly called a cadillac margarita. and its my favourite. the beautiful and special thing about this place is that the bartender stands at the bar and squeezes the limes right into your glass. there’s no bottled lime juice in this piece. it’s fresh and simple and it makes a world of difference in the finished product. we were served chips and 2 kinds of salsa at the table and tried not to stuff our faces too much, but it was damn fine salsa… but what i really wanted was the shrimp stuffed avocado. ya, this definitely falls into the american style food… but wow is it ever something. waaaaay too rich for a single human, but wonderful to share with a few people. 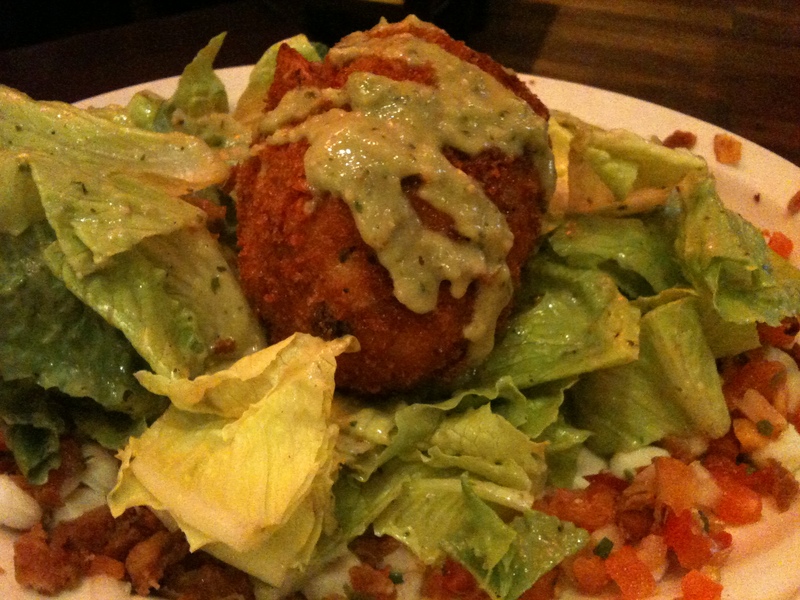 it is a half avocado, stuffed with a shrimp and cheese mixture, breaded and deep fried. its served on a lovely salad with tomatoes, bacon and hominy around the outside. and friends, it is GOOD. we only made it about 2/3 of the way through it, but ate up all the salad. the dressing is really nice on it, i wish i knew how they made it. we shared this and also got an order of the chicken tacos to split. mine, without onions, of course. 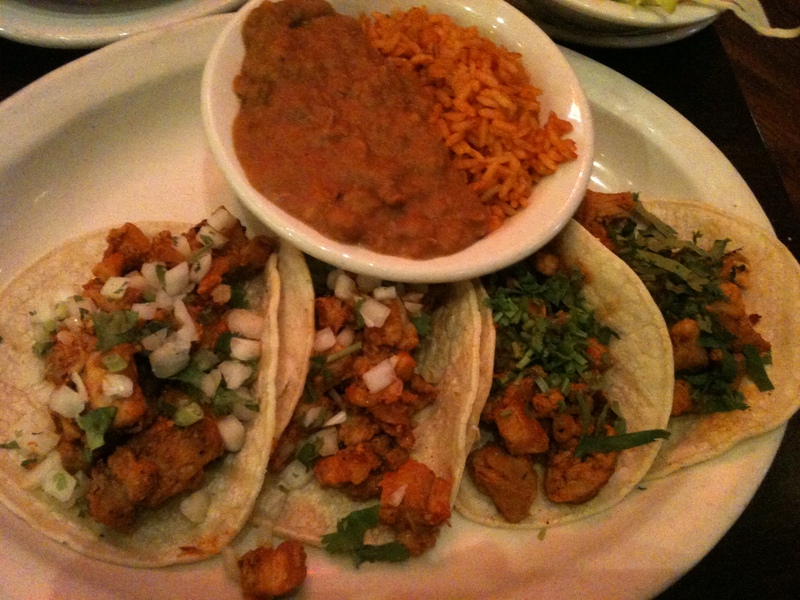 the chicken was nicely seasoned and i love fresh cilantro, but i must say that these lacked a sauce. i used the dish of salsa on the table and it rounded it out nicely. the beans and rice, while nothing special, were tasty. and i totally dipped my chips into them. hussong’s also has a restaurant.com gift certificate for them, so we saved $25 on our meal and walked out for about $20. bargain! this place is rad because the gift certificate is also good on the liquor. so you could just come here with a GC and get margaritas. hooray! a margaritas is basically a Whiskey Sour with Tequila. more-or-less. Did you bring me home a shrimp stuffed avocado like you promised? In all honesty, it’s the #1 reason why I want to go back to Vegas.